This is a review for the third generation Pokemon game, Pokemon Emerald. Aspects such as story and gameplay will be touched upon within. 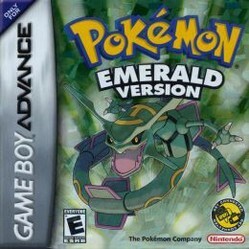 This article is a review of Pokemon Emerald, part of what is known as the third generation of Pokemon games, all released for the Game Boy Advance. This member of the most successful monster collecting video game series to date is an improved version of Ruby and Sapphire which is worth your time. It adds several features not present in the earlier iterations of the third generation that make it worth purchasing even if you've already gotten Ruby or Sapphire. Torchic: Fire-type Pokemon. You may have a bit of trouble in the early game, but this is the Pokémon to use if you want an easy endgame. Treecko: Grass-type Pokemon. The most well rounded of the three, as is usually the case for the Grass-type starter Pokemon. However it has weaknesses to Fire and Poison, two types that become horribly common later on. Mudkip: Water-type Pokemon. I love Water-types, so I invariably choose this one on all playthroughs. Things get sticky against Electric and Grass types though. So, having gotten your first Pokemon, you must now complete the Pokemon League Challenge, which consists in traveling around the region (in this case the region of Hoenn), capturing more Pokemon, and defeating the Gym Leaders to get their badges (most towns have a gym; there are 8 gyms; you must get all 8 badges). The gameplay is pretty interesting. First of all, you encounter Pokemon inside of grass (as well as in caves and while navigating on water as well). When you encounter them, and if you want to capture them to add them to your team, you must weaken them (the battles are turn-based). Once adequately weakened, you can throw Poke Balls at them. If you're successful, you'll get a brief fanfare and the game will announce your capture. Then, you will get the full Pokedex (a device that logs all of the unique Pokemon you've captured and/or discovered) entry for that Pokemon. Like in all other Pokemon games (at least those for the portables), there is an organization that conspires to bring the region down to its knees. In this particular case, there are two (Team Magma and Team Aqua). You will face both of them (a change from Ruby/Sapphire where you only face one and are allied with the other) in order to restore peace to the region. The plot itself is somewhat cliché, but then again very few games are truly original (in terms of plot) nowadays. The music is either appealing or annoying, depending on how you like the largely kid-friendly tunes. I don't mind them myself, but I've heard of people who play with the sound off because of it. The graphics are awesome, and I consider them a nice usage of the 32-bit capability that the Game Boy Advance has. It is played from a tile-based perspective (essentially 2D). You can also do miscellaneous things during your quest, like plant Berries (to later pick the Berries from the fully mature plant) and try to capture rare Pokemon in the Safari Zone (some of which can't be found anywhere else in the region. So, if you want to talk about this game or any Pokemon game in general, feel free to post in the comments section! This article will review Shin Megami Tensei: Strange Journey, a game frequently called Pokemon for adults. Aspects such as story and gameplay will be touched upon. Love your party based RPGs? So do I! On this page you'll find my favourite party based role playing games that is perfect for people who are just getting started on this sub-genre.